American Theatre, a nationally recognized magazine focused on promoting the arts and future art leaders, released their first issue of 2019 which highlighted current Theatre Administration students from around the United States. Amongst those featured was Jay Pension, a second year MFA Theatre Management candidate from the School of Theatre. Jay holds a BFA in Theatre Performance from Salem State University in Massachusetts. After graduating, Jay worked as a director and producer on over a hundred productions in Boston and New York City for more than ten years. 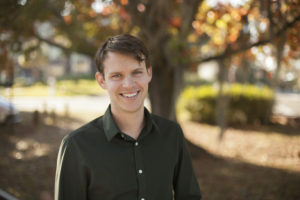 He chose to pursue an MFA so he would be “far more prepared to not only produce shows, but effectively engage with those around [him] as a manager and leader.” During his interview, he shares that the MFA program has helped change his perspective on himself and the way in which he views the world. The program has also challenged him to explore ideas and become adaptable in the ways he works with people and approaches problems. After graduation, Jay hopes to work at a large theatre in New York or New England, producing musicals or Theatre for Young Audiences. Jay is confident that the knowledge and training he acquired from the MFA Management program will help him achieve his goal. To learn more about Jay Pension, click here.